Ezra Klein directs our attention today to the chart on the right, from a mobile analytics company called Flurry. 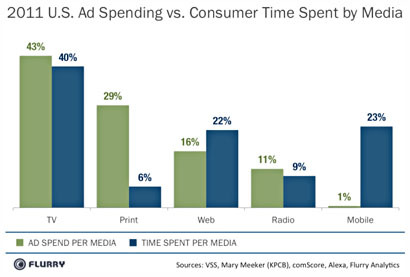 Their basic story is simple: the blue bars show how much of our media consumption time is spent on various platforms (TV gets 40% of our time, print gets 6% of our time, etc. ), while the green bars show how much money advertisers spend on these platforms. The verdict is clear: mobile devices command 23% of our time but are getting only 1% of the advertising dollars. Now, this data comes from a company that has a vested interest in hyping the mobile audience, so obviously you want to take it with a grain of salt. By way of comparison, Josh Marshall recently told us that TPM gets about 20% of its hits from mobile devices, and this is from an audience that’s very tech savvy and very mobile-friendly. But if it’s only 20% for TPM, the number for the population-at-large isn’t likely to be more than 10%. Or maybe even 5%. In any case, clicking through to various links, it appears that there are about 100 million smartphone users in the United States and they spend about an hour a day on various apps (that’s not including phone, text, and email). Of that, about 80% of the time is spent on games and social networking. So even if the mobile market isn’t quite as large as Flurry would like us to believe, it’s a pretty big and growing market any way you slice it. But now I’m curious: How much time do you spend with your mobile phone? And what do you spend that time doing?